M3 Mobile launches M3 SM15 Android Mobile Computer - M3 Mobile has unveiled its SM15 mobile computer, which is aimed at Transportation and Logistics, field service and warehouse environments. To accompany the device, M3Mobile is offering a full complement of accessories such as 2/8 slot cradles, vehicle cradle, scanning trigger and there are special accessories such as a HDMI cradle. The SM15 also has options for UHF readers, fingerprint and payment solutions. The optimized Android 7.1 platform enhances battery usage times. The powerful multi-task function improves speed. M3 SM15X has a 2.2GHz 8 core AP, 46% faster then other processors. M3 SM15 series has a high sensitivity touch panel which enables use with gloves and even in the wet. M3 SM15 series has a fast charging function. Full charge time is just 3 hours. 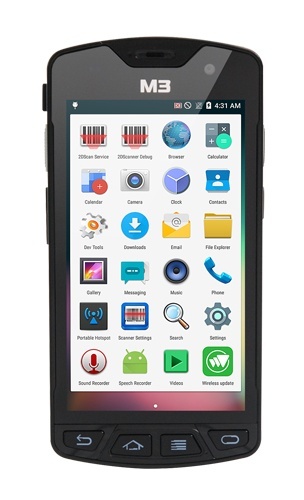 M3 SM15 series is a slim and light but rugged PDA with optional RFID reader. It can be used for ticketing and/or asset management wherever the mobile device is needed. M3 SM15 series can be operated within -20 degree to 60 degree and its storage temperature is -30 degree to 80 degree. It will guarantee the normal function at any temperature of working environment. M3 SM15 series is suitable to use in a tough environment withstands drops from 1.8m and protects against dust and water.